I am an inveterate reader. I just looked that up to be certain I’m using “inveterate” correctly and the dictionary said something like a “habit of longstanding.” I was one of those kids who hid under the covers with a book and flashlight after bedtime, so yes – inveterate definitely works for me. When I travel, I used to bring at least three or four books with me to read on the plane and during down time in the evening before bed. Now I have a Kindle for that purpose and my carry-on bag no longer has the potential to be used as a lethal weapon. I thought it might be fun (for me – maybe for you, too?) to occasionally share information about a book I’m reading that is related to travel. 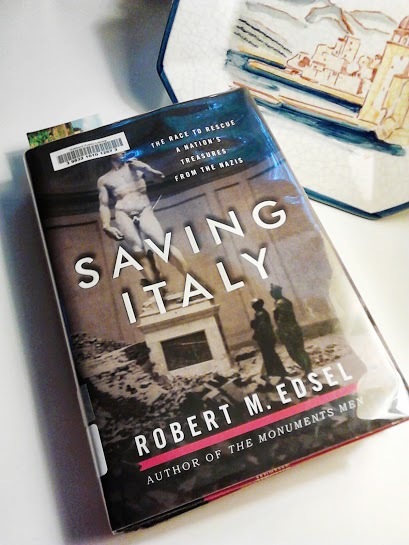 Right now I’m reading a new release called Saving Italy by Robert M. Edsel. It’s the story of the “Monuments Men” – American military personnel who tried to work within the constraints of, well, WORLD WAR II to protect and save as many of the irreplaceable paintings, sculptures and notable historic buildings from destruction. I would end up spending the better part of a day just trying to cover a smidgen of what this book addresses in detail, from the first days of landing in Sicily and then on to the “toe of the boot” of Italy, as the fighting made its devastating progress north to Naples, Rome, Florence and beyond. I remember hearing the names of battles at places like Monte Cassino and Anzio, but this book brings the past to light again in a way I’ll never forget – and especially if I am fortunate enough to return to Italy one day. If you have ever stood in the Academia to experience Michelangelo’s David, or gazed in wonder at Botticelli’s glorious Venus in the Uffizi; if you have ever wandered through the crowds ogling trays of gold jewelry in the shops on the Ponte Vecchio or admired the legendary doors of the Baptistery; if you have fallen in love with Florence (and Rome, and Naples, and . . . ), then you will be astounded to read what the Italian people and their exquisite cities endured as the Allied troops forced the Germans to the North, one bloody inch at a time. 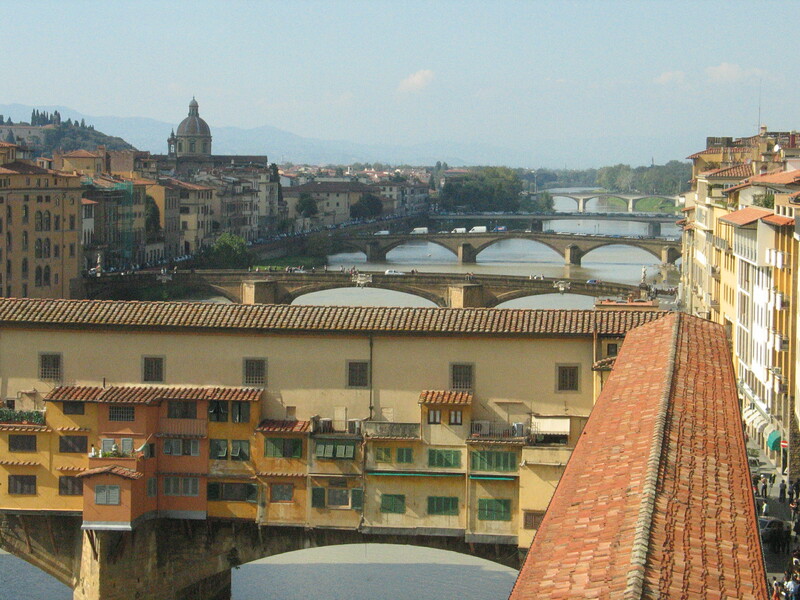 I did not realize that the Nazis blew up all the bridges, except the Ponte Vecchio, to deter the advancement of the Allies into the city. And, all the buildings on either side of the river flanking the Ponte Vecchio were flattened to rubble. When you visit today, you would never guess such a thing took place. The bridges are beautiful. The buildings look like they’ve been there since the Medici’s ruled Tuscany. I was so surprised to learn that Florence had experienced such damage, and that the restoration was so carefully and successfully executed, today ignorant tourists like me can believe the city had been spared. If you love Italy, if you love art, if you wander the cobbled streets in awe of this country’s precious buildings and sites of antiquity – read this book. Hats off to the Monument Men, and to all the Allied troops and proud Italians who worked in the midst of a hellish war to preserve the treasure that is Italy for future generations. This entry was posted in Travel, Uncategorized and tagged art, bridges, Florence, Monument Men, Ponte Vecchio, Robert Edsel, Saving Italy, treasures, World War II. Bookmark the permalink. This is the second of two books he wrote. His initial plan was to write one comprehensive one, but he had too much material, so he wrote the first one on France, Germany, and surrounding N Euripe treasures. I enjoyed that book and look forward to reading this one on Italy. I gave the first one away to a former student who has masters in art and is a curator in Burlington VT. Thanks, Jayne. I will look for the others! Again, you make books that I might have passed by, sound like I HAVE to read them! I must look for these two books – thanks so much for sharing. I love reading and I love traveling, (should I say loved traveling, don’t get to do much now with the 3m’s) – so please, share away. When I’m not in the kitchen baking for the 3m’s, I’m reading! Thank you for writing! Reading, traveling and my dogs are my passion, too! Sounds like a fascinating read. I love knowing about the history of Florence and its masterpieces, knowing that they’ve survived war, floods, vandalism etc makes them all the more precious now. Yes! For Florence to go through that terrible flood in the 1960’s not so very long after recovering from the war is hard to imagine. It’s a city with heart and great strength and determination. You are near Lucca, right? One of my dreams is to stay in Lucca for several weeks to study Italian at one of the language schools in that exquisite city. What a wonderful part of this world you live in! We live in Lucca at the moment, eventually I’d like to move to the hills outside the city, but it’s a lovely place, and would be ideal for a month-long stay as it’s the perfect size and a great base for exploring the region. We are spoilt here, basically I’m just lucky that Michele is a native Tuscan, it’s made living her possible. We live in Lucca, but eventually I’d like to like in the hills outside the city. It’s a wonderful city though, a great base for exploring Tuscany and the perfect size to get to know during a month-long stay… I hope you get to realise the dream! Really enjoyed this article. Happy to be an inveterate fan of your writing and will definatly pick up a copy of the book! Thanks so much, Nick! I am now totally engrossed in “Transatlantic,” Colum McCann’s new book. I LOVE his writing and “Let the Great World Spin” has to be in my top ten favorite novels ever. Great to hear from you – xoxo!